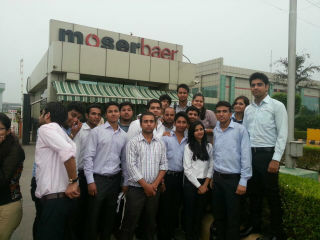 Students of PGDM and PGDM (International Business) 2014-2016 Batch went for an industrial trip to Moser Baer Manufacturing Plant in Udyog Vihar, Greater Noida on 4th August, 2014. Mr. Sudhanshu Pathak, DM – Training and Development (Factory Operations Manager) gave presentation related to the history of Moser Baer and its operations and production to the students. 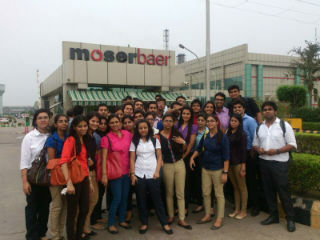 Students were taken around the plant and were explained about the production and operations process of Moser Baer’s products – CD’s, DVD’s, Solid Storage Devices, Photovoltaic panels and home entertainment products. Students also interacted with the staff of production plant of CD’s and DVD’s. It was a great learning experience where students could learn both about technical and management skills used by the company in there processes.